SQLyog Job Agent allows you to generate, format and send personalized mails with results returned from a query. SJA allows you to schedule execution of query(s). The resultset(s) can be emailed to multiple recipients. You can also use this feature to execute maintenance queries. This page allows you start up a new Sql scheduling and reporting session or to edit an existing session. 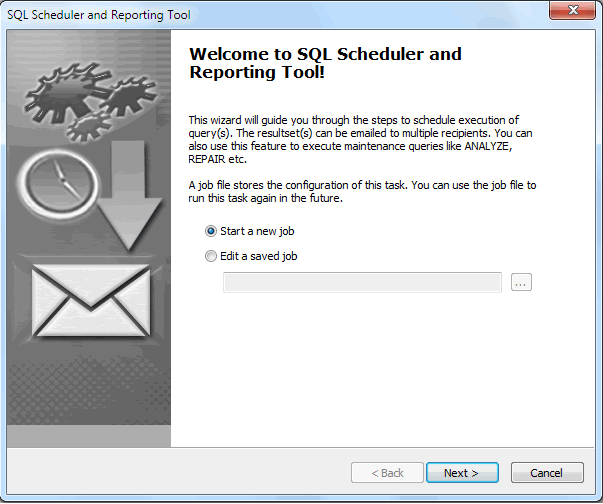 Select "Start a new Session…" and click Next to start a new Sql scheduling and reporting session. Note that it's not required to have SQLyog currently connected to any database to execute the operation. The session establishes all required connections during the operation execution. Note:This feature is available in SQLyog Enterprise and Ultimate.